The Hilton Garden Inn Baton Rouge Airport hotel is located in the vicinity of lots of great things to do in Baton Rouge.Whether guests enjoy shopping or visiting historic locations within the Southern Louisiana area, there are many choices that are all within a short drive of our Baton Rouge hotel.Our cozy Baton Rouge hotel is minutes away from the Louisiana Baton Rouge Metropolitan Airport-Ryan Field. Complimentary shuttle service is available to the airport as well as within a 5-mile radius of our Baton Rouge hotel.Guests of the Hilton Garden Inn Baton Rouge are nearby to these great Baton Rouge attractions: *Baton Rouge River Center*Historic Government District*Louisiana State Capitol BuildingDeluxe accommodations, friendly service and a relaxed Louisiana style atmosphere await guests at our Baton Rouge hotel. What sets us above other hotels in Baton Rouge are the array of special amenities which are certain to please any guest: *Complimentary High-Speed Internet Access*Fitness Center*Swimming Pool and Whirlpool*24-hour Complimentary Business Center with Secure PrinterOn Printing Stop by the Great American Grill, our on-site restaurant, which features an all-you-can-eat breakfast buffet, as well as lunch and dinner. 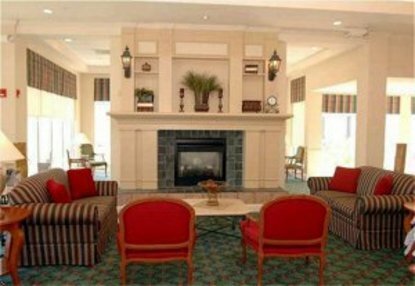 Guests of the Hilton Garden Inn Baton Rouge will find the lounge is a great place to relax with a favorite beverage. The Pavilion Pantry has a selection of refrigerated, frozen and microwaveable packaged items, which are perfect for in-room preparation. Come enjoy Louisiana hospitality and exceptional service that's above and beyond other hotels in Baton Rouge. Experience the Hilton Garden Inn Baton Rouge - Everything. Right where you need it.